In stark contrast to what was a difficult ending to 2018 (-13.52% quarterly performance for the S&P 500), the transition into 2019 for the U.S. stock market was spectacular (+13.65% quarterly performance for the S&P 500). The impressive comeback advanced all eleven sectors into positive territory, an occurrence not accomplished since 2014. Technology stocks continued to lead the way with energy sector, aided by a rise in oil prices, also posting strong results. The final reading for real gross domestic product came in at 2.2% for the fourth quarter, falling short of consensus expectations that were closer to 2.6%. Weaker consumer spending, news of growing tensions in finalizing a trade agreement and the threat of higher interest rates negatively impacted growth. A slowdown in Eurozone manufacturing against the backdrop of contentious Brexit negotiations have affected Eurozone growth expectations and could have some implications for the U.S. trade negotiations between the United States and China, adding to the unsettling business environment for U.S. corporations. Considering these uncertainties, U.S. GDP expectations for the first quarter of 2019 are now in the 2% range. Employment remains a bright spot as the current unemployment rate moved down to 3.8% with a stronger labor participation rate of 63.2%. The current February reading on nonfarm payroll growth disappointed with a very weak reading of 20,000 against an estimate of 180,000. Most view the February reading as an anomaly and expectations are for a return to strong employment growth in the coming months. Surprising many, healthy employment growth over the last few years has been accomplished with very little inflation. Current February Core and Headline inflation stood at 1.5% and 2.1% respectively. The stock market had a very strong first quarter as all domestic indices rose to start the year. The overhang of higher interest rates that sent stocks spiraling lower at year end was suddenly and, to some, surprisingly removed. Led by Jerome Powell, the Federal Reserve Bank reversed course, signaling a new patient and accommodative approach. This was just what the stock market needed to begin the climb higher based on renewed liquidity for all. 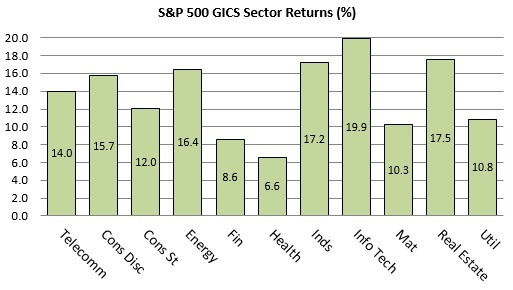 With a 16% return, the tech-heavy Nasdaq Composite led the charge for U.S. stocks in the first quarter. The Dow Jones Industrial Average advanced 11% for the quarter. Sandwiched between was the S&P 500 gaining roughly 13%, its best quarter since 2009. Looking closer at the first quarter, growth stocks continued to outshine value and small-cap edged out large-cap. U.S. large-cap growth stocks continue to outperform in almost all categories – a trend that has been in place for some time now. International stocks advanced on trade talks and stronger conviction that global growth will stabilize as Central Bankers keep money flowing throughout the system. Although positive, international stocks continued to lag U.S. markets. Surprising many investors, the Fed substantially reduced the likelihood of any rate hikes in 2019. As a result, investors were once again faced with an inverted yield curve where the yield on a ten-year Treasury bond dropped below the yield on the 3-month Treasury bill. The ten-year finished the quarter at 2.39% vs. the 3-month bill at 2.43%. Yield curve inversions can be worrying because of their association with recession. Every recession since 1962 has been preceded by a yield curve inversion, however, the timing and magnitude has been inconsistent. Of additional note, over the same period, a yield curve inversion has resulted in a false positive approximately 20% of the time. Stated differently, an inversion has not always lead to recession. Interestingly, history does not provide any context for yield curve inversions at today's low rates. Previous inversions/recessions have been accompanied by strong economic growth and inflation pressure, both absent today. The stock market made history by celebrating a tenth year of its bull market. The anniversary was cheered by investors who experienced exceptionally strong returns in U.S. stocks over the period. Expectations are that the current expansion becomes the longest in modern history later this year, however, as with all milestones, the question of "how long will it last?" is occupying more of investors' thoughts. Current valuations place the stock market at a forward P/E ratio at about 16 times 2019 earnings, slightly below the five year average of 16.4 yet above the ten year average of 14.7. Corporate earnings growth will be a key catalyst for market returns going forward. Slower earnings growth combined with low interest rates may be enough for investors to continue celebrating as we move through the year. These facts and opinions are provided by the Cape Cod Five Trust and Asset Management Department. The information presented has been compiled from sources believed to be reliable and accurate, but we do not warrant its accuracy or completeness and will not be liable for any loss or damage caused by reliance thereon. Investments are NOT A DEPOSIT, NOT FDIC INSURED, NOT INSURED BY ANY FEDERAL GOVERNMENT AGENCY, NOT GUARANTEED BY THE FINANCIAL INSTITUTION, MAY GO DOWN IN VALUE.